Jade, hens-and-chicks, rosette crassula and donkey’s tail all grow well once you cut them. You can later use these cuttings and place them in a wreath frame wrapped around with sphagnum. 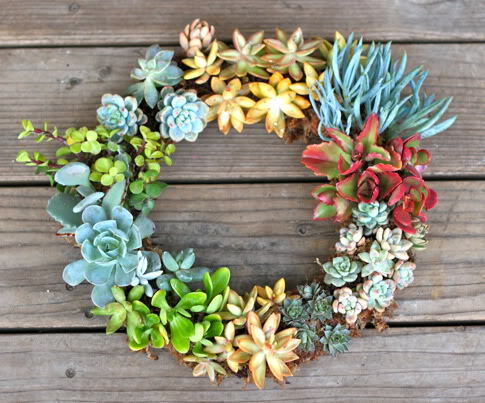 This will help you create a succulent wreath centrepiece which will last for many years to come. You can start by preparing the succulent cuttings. Do this by cutting pieces of established plants a few days before you plan on making the wreath. In order to make an 8-inch wreath, an average sized shopping bag full of cuttings will be sufficient. All the cuttings must be at least 3 inches long. Wait until all these pieces dry off so they can form a scab later on. Grab a #24 paddle wire and attach its tag end to the wreath frame’s wire. Take the sphagnum moss and soak it in water. Use a bucket to perform this action. To make an 8-inch wreath, you will need at least half a bale of sphagnum. Now hold the wreath frame in one hand and start covering it with sphagnum moss using the other hand. Make sure that the brown side is facing up while both the sides of the frame must be overlapped by 2 inches of sphagnum moss. Take the rooting hormone and dip the succulent cutting inside. Make sure that the end you have cut is the one dipped inside. This will prepare your succulent cuttings the way you want them to be. Simply put them on top of the moss-covered frame and make sure that they are close to the wire attached to the frame. The cutting, however, should lie beside these succulent cuttings. Grab hold of another damp moss and cover the cut end of the succulent piece with it. Once it has been wrapped and covered, wrap the overlapped moss around the new piece of moss which you just laid down. Now wrap the whole frame with the paddle wire. Keep a gentle touch on areas where the stems are. If you try to wrap the wire tightly, you will end up damaging the succulent. Keep adding cuttings and covering the moss while you wrap the wire around. Continue doing this until there are no cuttings left. Simply tie the wire at the back of the frame to finish things off. With the wreath made, simply soak it in water in order to settle the plants.